We love documentaries in our house. My husband and I watch them often, and recently we have had the privilege of reviewing together as a family these amazing documentaries about some amazing teens! What an inspiration these movies are for all young people, especially homeschoolers. 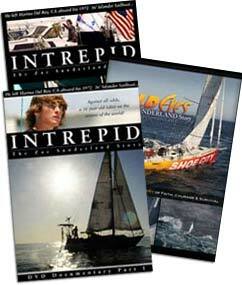 Intrepid tells the story of Zac Sunderland and Wild Eyes is Abby Sunderland’s story. We watched these movies that document Zac’s story with video from his actual trip on the edge of our seats. They were exciting to see and we felt like we were part of his adventure! Most importantly, my kids came away inspired. Seeing how a homeschooler was able to accomplish such a huge feat was amazing. That’s the beauty of homeschooling- to be able to pursue a passion uninhibited by a classroom. To be able to pour yourself into your gifts and your talents- the learning opportunities are endless. It is evident by Zac’s feats. Zac and Abby are dyslexic and their early struggles with school are part of what led to their amazing perseverance. Abby even wrote a book (with a little help!) Simply amazing and a testimony to homeschooling. I remember hearing about Abby’s story when I first began homeschooling. She was on the news during her ordeal in the Indian Ocean. I was just a new homeschooler then, scared and hesitant. It’s pretty surreal to now get the chance to be reviewing these movies, and they inspire me to let me children pursue their gifts, their talents, and their interests- to grab hold of the opportunities that homeschooling allows, and to let them be who God has created them to be, and to never doubt that they can achieve great things! These documentaries are faith-based, family-friendly and inspiring. They have won several awards at various film festivals including Best Documentary and Best New Director. World Wind Productions is graciously offering a 40% discount on these movies with the code HAPPY2013. Head over there and get yours. They are surely an inspiration to all families! Called Home- JUST $0.99 Today!